Home » Reviews » BoldGrid Review: Who Should Choose the BoldGrid WordPress Website Builder? BoldGrid Review: Who Should Choose the BoldGrid WordPress Website Builder? This is BoldGrid Review… BoldGrid is an amazing website builder that has been specifically designed to create custom websites in merely three simple steps. 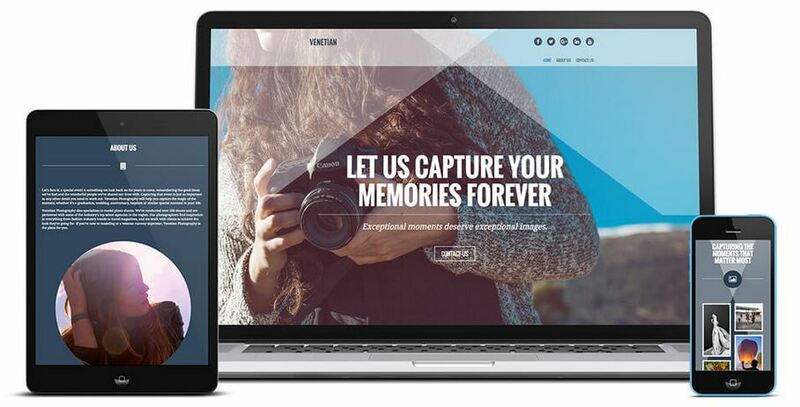 This tool is essentially a merger of WordPress themes and plugins, which regardless of your expertise and web development proficiency, gives you the freedom to manage the overall layout and presentation of your site. BoldGrid is ideal for those who want to build customized websites, but don’t possess the sufficient skills and competence to accomplish their objectives. BoldGrid because of its flexible working and open source attributes gives you the power to develop a website that truly complements your innovative perception, at the same time safeguarding that you maintain 100% ownership rights. The best part is BoldGrid also helps experienced developers as it considerably augments your development procedure and gives you freedom to create effective and functional web pages than ever before. Go through this detailed BoldGrid review to unearth some of the basic features of this WordPress website builder along with pricing details and all the pros and cons associated with this tool. BoldGrid is loaded with a wide range of useful features, including an array of appealing website templates, a plethora of customization choices, and a practical page builder tool. With BoldGrid themes, it’s now on your fingertips to create impressive and eye-catching custom WordPress sites. The availability of a number of excellent themes and inspirations gives you an opportunity to experiment with your creativity and develop awe-inspiring websites. by using this awesome website builder. If you’re not a proficient web developer or your coding skills aren’t satisfactory to build a persuasive WordPress site, BoldGrid customizer can help you add a personalized touch to your site. With this tool, you’d be able to handle and modify numerous aspects of your site. All you need to do is to make changes from the front-end user interface and you can witness the modifications right away without swapping browser tabs and windows. Alongside giving you control over the presentation and design of your website, BoldGrid also enables you to change the specific fragments of your site. 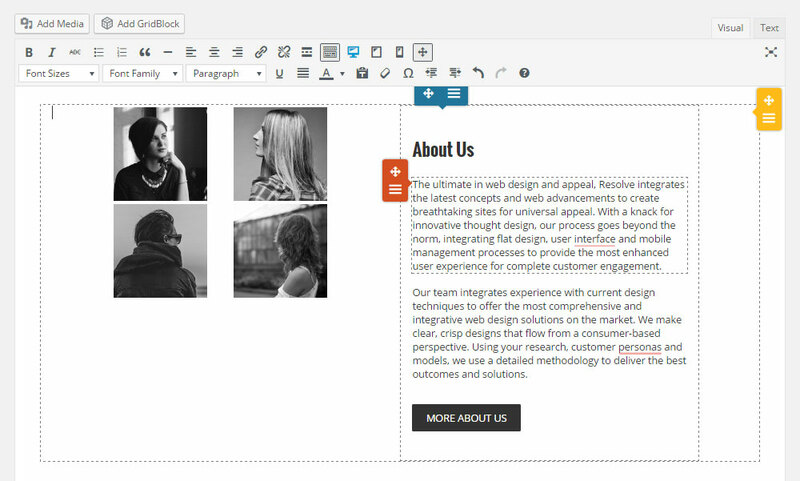 The BoldGrid editor enables you to incorporate GridBlocks to your pages. For instance, by using the library of GridBlocks, you can control testimonials, an array of text as well as image settings, header area, image galleries and a vast range of other design and content aspects. Using GridBlock is as simple as it could be. Once you’ve included this feature in your page, you can simply click on it to begin editing the available content. In addition to that, you can also conveniently drag and drop it at a fresh location. Another extremely effective feature of BoldGrid tool is the staging service. By employing the alternative staging mechanism, you can build a private variant of your site that isn’t accessible to your site visitors. This personal access gives you an opportunity to work in a true development environment. This is the place where you can experiment and freely work on your site. While you’re working on the staging variant, the active variant of your WordPress site remains visible to the public. Despite this feature is extremely helpful, it’s completely optional and it’s up to you whether or not you wish to access the staging variant of your site. Thus, if you want to avail the active version of your site, you’re absolutely unobstructed to do so. Theoretically, BoldGrid acquires an incredible range of features. There are primarily 3 basic steps through which a developer can create a fully functional, custom website. First, you need to select a theme or inspiration from the available BoldGrid templates. You can choose a category that compliments your project type and your requirements. Once you’ve selected your category, it’s time now to pick from the correlative templates. The good news is BoldGrid offers these amazing templates without any cost, contingent upon you’re ready to add your own content. However, if you wish to get access to the protected content in the themes, you’ve to pay for that. BoldGrid comes with a vast variety of base layouts from which you can select one perfect design for your project. While choosing a layout, you can also preview how this theme will look on your site. By doing so will help you take a wise decision. Once you’ve selected your website template, you can now select how many pages to build. The choices include building a standard set of pages, the kitchen sink alternative that includes a swarm of functional pages or the Five Pages option that incorporates five most customary pages for your category. In case you opt for the kitchen sink alternative, the demo pages will include gallery pages, testimonials, clients and also the base pages including ‘About Us’ and ‘Contact Us’ pages. After completion of all these steps, you can now add your custom content to the site. For a customized touch, you can load up the BoldGrid customizer and begin customizing the theme. turnaround time, however, there is no time assurance involved. Through customizer tool, you can give your WordPress website a personalized feel. BoldGrid customizer includes all the tools and widgets that you may need to change the appearance of your site including fonts, colors, background, menus, header/footer widgets and advanced settings. Moreover, if you’re not satisfied with the predefined color palettes, customizer gives you freedom to create your custom color palettes. Including backgrounds through the customizer is very simple too. Alongside changing the background, you can also modify the background effect, sizing options, etc. Previously in this BoldGrid review, we pointed out the Editor feature. This feature is retrieved at the page level and distinct posts. Through BoldGrid Editor, you can build custom layouts for your content that wouldn’t be feasible with the traditional WordPress Editor. Whether you want to create your pages from scratch or choose to select demo pages for your site, you can effectively control things through BoldGrid Editor. One of the most interesting features of BoldGrid is you can make changes from the front end and don’t need to go again and again on the back-end to make modifications. This is incredible as it makes the web development and maintenance process absolutely hassle-free. The ‘update channel’ option available in the settings section gives you an opportunity to get your hands on the latest BoldGrid versions or you can even unearth the upcoming BoldGrid releases through the Edge settings. 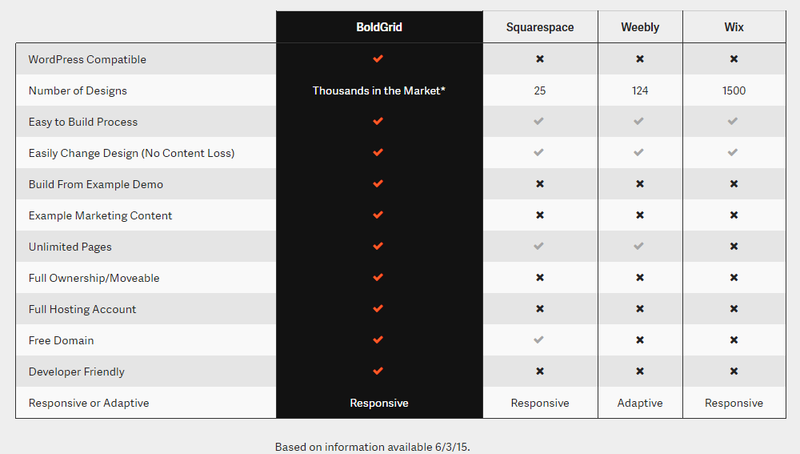 Despite BoldGrid is based on WordPress, its major contenders are the other site building tools such as Weebly, Squarespace and Wix. Luckily, BoldGrid outpace all its competitors in terms of its outstanding features and the ownership rights it grants to the users. BoldGrid is accessible for free to users of InMotion Hosting who have registered to one of their Business Hosting packages. Moreover, BoldGrid team is also planning to associate with other popular web hosts from around the globe. The purpose of this is to form licensing contracts that will help BoldGrid gets international acknowledgement and availability all over the world. You can select one of the below listed pricing plans while signing up with Inmotion Hosting. The FAQ section of the website is very short. Seemingly, BoldGrid is just another Website building tool. However, as it’s strongly linked to the web hosting plans provided by InMotion Hosting, it is intending to be a substitute to other hosted options like Wix and Squarespace. This alliance and merger help to make this tool an excellent choice for developers probing for an all-in-one solution for their sites. BoldGrid web building tool is specifically ideal for those who want to add the touch of personalization and individuality to their sites. Especially, if you’re new to the field of web development and don’t have sufficient experience in handling complex coding and other convoluted elements, BlogGrid is your ultimate option. It’s functional, reasonably priced and absolutely easy to use. Loved this platform, looks like those who don’t know coding can easily build theme using boldgrid. The best part is it supports so many other platforms too. Thanks for sharing the BoldGrid review. I’m glad you liked the BoldGrid review, James! Thanks for leaving your comment.